Junior resource investors are accustomed to uncertainty – in fact it’s been pretty much par for the course over recent years. And like any seasoned exploration company, it’s essential to be able to handle uncertainty and maintain an optimistic outlook. For it is resilience that is part and parcel of the resource sector. After all, there’s no point being a pessimist. If this were the case, companies would abandon exploration programs after the first drill-hole that failed to hit pay-dirt. As a consequence, most of the world-class discoveries here and abroad would never have eventuated. It is persistence that leads to discovery. The junior resource sector is all about sentiment – and never is this more evident than in 2019. Sentiment is typically influenced by a range of factors such as commodity prices (a good gauge of underlying demand), the ability of resource companies to access funding (and carry out meaningful activity), and China’s appetite for raw materials (by far the biggest consumer of commodities). An excellent case study of the impact of a softening dollar is gold, which typically moves inversely to the US dollar. Gold fell victim to US dollar strength caused by rising US interest rates, but the yellow metal has recovered since August 2018 as bargain hunters moved in and price momentum builds. Copper too is proving resilient against the US dollar. I’m of the opinion that the recent weakness in commodity prices – and by association resource equities – is overwhelmingly a transient phenomenon that’s driven more by speculators and traders, rather than any fundamental change in intermediate or longer-term economic fundamentals. The reality for 2019 is that real demand for most commodities remains robust and inventory levels are falling. Ultimately, this presents a compelling opportunity for investors. If President Trump gets even the smallest concessions from China, it will boost his political standing in the wake of the recent disappointing mid-term elections in the U.S. Meanwhile, President Xi would further cement his position as the strongest leader of China since Chairman Mao and his profile on the global stage. Similar deals with other trading partners could quickly follow on the heels of an agreement with China. Gold will be at the forefront due to ongoing uncertainty and the likelihood that rate rises in the US will slow, meaning limited US dollar gains. 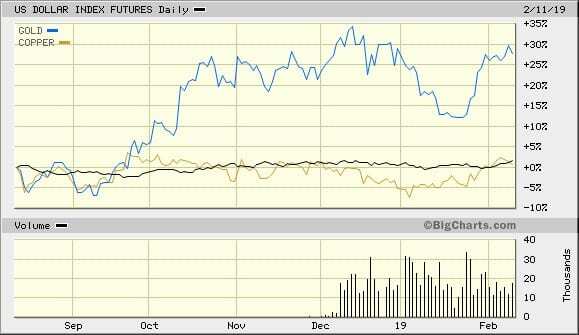 This represents a positive combination for commodities, especially gold. 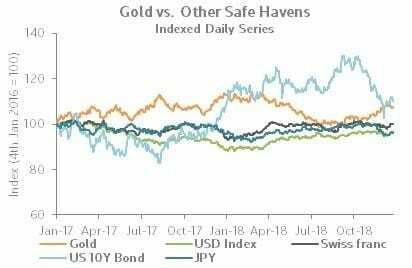 Gold is performing well against other ‘safe haven’ assets, as the graphic below shows. 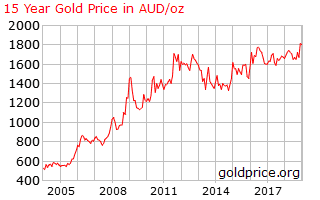 Furthermore, the gold price in A$ terms presents a particularly compelling image. Nickel is poised to recover after a somewhat misplaced fear of ultra-cheap battery-grade nickel flooding the market starting in 2019. In September last year a Chinese consortium announced a new $700 million High-Pressure-Acid-Leaching (HPAL) plant in Indonesia, which would produce 50,000 tonnes a year of battery-grade nickel chemicals commencing this year. Two similar projects in Indonesia were announced around the same time, collectively helping to send nickel prices to seven-month lows. But the history of previous HPAL project developments is problematic to say the least and the amount of nickel to be produced could well be less than half what the market is anticipating and at far higher cost. 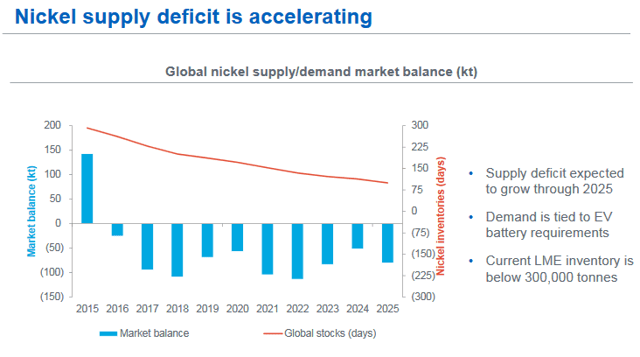 The bottom-line is that the nickel market is looking at another supply deficit for this year and in 2020. Reuters reports that official LME nickel inventories fell by 44% in 2018 and just recently fell through the 200,000-tonne mark for the first time since 2013. Copper is a crucial commodity because it’s utilised in an enormous variety of applications – from the construction industry to motor vehicles, from household electrical goods to energy transmission. Hence, it’s the world’s key industrial metal in terms of both volume and its influence on world markets. Inventories on the world’s leading copper exchange have declined steadily since early 2018 and recently hit a low of 120k tons – almost 265k tons or 70% below their level in March 2018. In fact, LME copper inventories are currently at their lowest level since at least 2008. Another commodity that’s set to continue to drive interest in 2019 is uranium. It’s been a long time coming for the sector, after several global events, including the Fukushima nuclear disaster and Kazakhstan ramping up uranium production, tipped the uranium market into oversupply during 2011. A gruelling seven-year bear market that dragged the uranium price down by 85%, green shoots are now emerging with the uranium spot price soaring almost 40% between April and November 2018. It goes without saying that battery materials – including lithium, vanadium, graphite and cobalt – will remain at the forefront of investors’ minds, driven by the green energy thematic. The electric vehicle (EV) revolution in particular tends to hog the headlines, but there’s another battery market that’s often overlooked – solid state batteries. In fact the value of the market is forecast to grow by a factor of 26 times between 2017 and 2025 – to $1.4 billion from $53 million in 2017. Solid state batteries use solid electrodes and solid electrolytes, instead of the liquid or polymer electrolytes found in conventional lithium-ion or lithium-polymer batteries. The technology is more difficult to engineer, but promises a battery that is of higher capacity, higher density, higher performance and faster to charge. 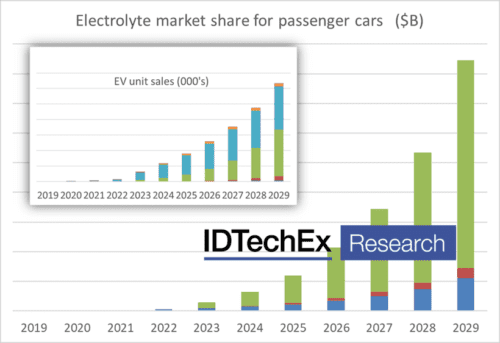 The electric vehicle sector will be the most lucrative market for solid state batteries, growing at an annual rate of 59% per cent, with big car makers like Toyota, Volkswagen, Hyundai and BMW all developing solid-state batteries for electric vehicles. Sovereign risk is an escalating issue for resource juniors all around the globe, but never have the risks been as great for companies and investors. Australia’s credentials as a safe place to do business are likely to be reinforced by ongoing security issues internationally. 2019 has started with an exploration company employee being abducted and killed in Burkina Faso, while political instability rears its ugly head again in places that have become popular of late for ASX hopefuls, like Zimbabwe and the DRC. With volatility continuing during 2019, but underlying economic fundamentals likely to remain ok, expect this year to be characterised by heightened corporate activity. We’ve already begun the year with two gold mergers internationally at the big end of town (Barrick-Randgold and Newmont-Goldcorp) and this is likely to be replicated at the smaller end of town. Volatility is making resource lenders nervous, despite many junior companies having fully-permitted projects that have been essentially de-risked. Opportunistic predators further up the chain will be eyeing off such opportunities to grow their businesses.